The hateful and malicious (spiritual) terror campaign of the Evangelical Broadcasting Channel against the Christian Aramean nation continues undiminished……. The merciless "jesus" of the West uses the apostate Arameans who call themselves “Assyrians” to extra terrorize and taunt the persecuted, mutilated and humiliated Aramean people. The occult believe system (here and here) of the apostate Arameans who call themselves “Assyrians”, the unholy product of the Western colonial powers to destroy the Aramean nation, is a direct copy of the belief system of the illuminati Satanists, they have drummed it in their minds and souls. The occult system was established after the Flood by Nimrod and Samiramis in which satan is worshipped instead of the God of Abraham, Isaac and Jacob. It is the Babylonic belief system, the system of Samiramis, the whore of Babylon. 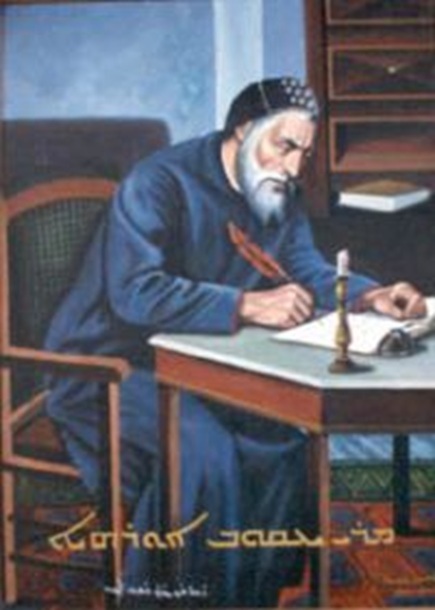 Veneration of Nimrod and Samiramis is at the core of the cultural expressions of the colonial Western division and hatred promoting product “Assyrians”. That is the reason why the Cabalistic/ Talmudic/ Freemasons/ illuminati Satanists put their spiritual brothers “Assyrians” at the center of attention, because they have the same believe system. Misinformation / fake news about the Aramean nation and the unprecedented love for spreading “Assyrianism” is therefore not surprising to us, because there is a plan behind it. The overwhelming majority of the Western colonial mainstream media, including the so-called “christian” media, is controlled by the international intrigue (here, here, here, here, here and here). No one article is published without inspection in advance, because: “NOT A SINGLE ANNOUNCEMENT WILL REACH THE PUBLIC WITHOUT OUR CONTROL” (illuminatie protocols of the Elders of Zion No. 12, section 3 and 4). 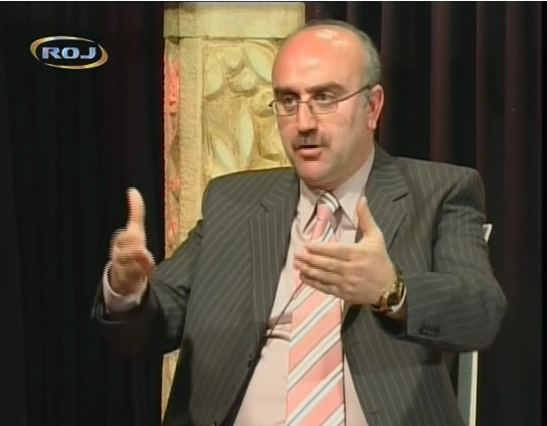 Professor Dr. Muhammad Shamsaddin Megalommatis says, “Obliterating ……… one nation’s identity is a most criminal deed…..”. And the Evangelical Broadcasting channel is working very hard, since a long time, to achieve this unholy goal. They are working intensively with the pseudo- Assyrians who are engaged in terrorism - the ultimate product of the Western spiritual colonial activities in the Middle-East in the 16th and 19th centuries (here, here). - Hateful, because: This is the such-and-such cowardice and cunning attempt being undertaken to falsely present our people in Holland as “Assyrians”, in the name of “Jesus” of the West- who definitely is not the Jesus Christ of the Bible. They work together with wicked people who are involved with terrorism as agreed between the terrorist organizations PKK and ADO. - Malicious: This is not the first time that some wicked people within the EBC wilfully try to distort the origin of the Aramean people by presenting them as “Assyrians” in spite of the letter we sent together with our bishops to the government of Iraq not to be identified as such. - Hypocrite and rotten because: They do everything to depict Islamists as barbaric and dehumanized, but neglect the fact that their forefathers carried out atrocities in the name of “Jesus” (here, here)– this of course should not be confused with the Jesus Christ of the Bible – against the Aramean nation and they continue to do so. To present themselves as “civilized” and “sympathizers”, they utterly crack down the Islamists and Islam. They clearly double standards. All these unholy acts are being carried out in the name of “Jesus”. - Racist: The emotions are being manipulated in a dirty and ugly way and the sufferings of one group neglected while others being brought into the prominence. The viewer is falsely and deliberately being informed as though only Christians suffer in Iraq, while also hundreds of thousands Muslims, Yazidies and others are being killed, Mosques and other holy places of prayer being destroyed in mutual struggle between Sunnis and Shiites. In 2007 175 Yazidies of the mountains of Shingal were killed by a care bomb attack. By some of the victims body parts were missing; others were literal immersed in their blood, many of them were wearing white clothes, which completely were painted red in their blood. Well then, don’t all these terrible events deserver to be mentioned as well? - Immoral, criminal and objectionable, because: according what we know, they willingly made themselves the doormat of madam Tunc, who according to our information has been involved with recruitment of youngster for the PKK at various occasions under the cover of “cultural” and “social” manifestations. In Iraq there are no more than 10.000 East- Aramean Nestorians who eventually might call themselves “Assyrians”. The vast majority of Aramean Christians do not want to be identified with this fake immoral Western spiritual colonial name which has destroyed our nation. The EBC purposefully continues to maintain and develop the spiritual colonialism of their forefathers with devastating consequences for our nation. - Low and below all the human standards and values because: To our view only a wicked and a completely dehumanized person is able to justify and glorify such destructive crimes of history falsification. The EBC presents itself as though they testify of Jesus Christ of the Bible. The word “Evangelism” implies that they want to spread the good news to the world, in this case to the Netherlands, to enlighten them. From this follows that those working with EBC, one may assume, are people who adheres to the goods news, thus follow Jesus Christ. Of course one cannot generalize this and say that everybody within the EBC have evil intentions; that would be wrong. On the contrary, there are pious and honest people within EBC who sincerely work for the goals the EBC stands for. Our criticism is only aimed at some immoral and hateful racists, having powerful media positions within ECB, who since a long time are waging a spiritual war against the Aramean nation by presenting them as “Assyrians”- a genocidal and a unholy product of the colonial powers who brought about havoc in the Middle-East and have besmirched the name of Jesus Christ of the Bible by planting hatred and division within the Aramean nation. And the two “Christian” broadcasting channels ECB and NCRV continue with their atrocities against our nation as if though the colonial powers have a done good and a holy job. On the other hand, the noble forces within ECB should once make their voice heard against these filthy, hateful and wicked people within ECB. Otherwise they are accessory to their atrocities against the Aramean nation. These wicked forces within ECB started knowingly and brutally since 2000 via diverse broadcastings to present our nation in the Netherlands as “Assyrians”- an objectionable and an immoral invention of their forefathers which has led to hatred, division and extermination of the Aramean nation. They are committing cultural/ spiritual genocide against our nation. For this reason we are convinced that the Good News the ECB claim to preach has nothing to do with the Jesus Christ of the Bible, but is a continuation of the unholy and evil deeds of the Jesus of the West who has divided the Aramean nation by the invention of the fake identification “Assyrians” (product of Anglican mission together with England) and “Chaldeans” (product of Catholic mission together with France). For this reason, we believe the sincerity some people within ECB claim to stand for is fake and is a evil spiritual terror against not only the Aramean nation, but also against others, they clearly misuse the name of "jesus". As previously mentioned, for years they are active in the name of Jesus Christ of the Bible to distort the history of the Aramean people by presenting them as “Assyrians”- an unholy product invented by their forefathers. This is nothing but a criminal spiritual genocide. They seems to be so wicked and evil that they do not feel bound by any rules or morality, they continue unhindered with their terror against our nation in the name of “Jesus”. We cannot underscore enough to make clear that it is very important to understand that: The criminal and hate-generating "jesus" of the West is definitely not the same as the true Jesus Christ of the Bible who is the God of Abraham, Isaac and Jacob and revealed Himself to the world in human body. "jesus" of the West stands for colonialism, division, hatred, deceit and destruction. Because of the crimes of jesus of the West, Christianity in the west have been destroyed and marginalized. It was the criminal "jesus" of the West who: 1) initiated crusades in the Middle-East, 2) has incited nations against each other and 3) divided and exterminated many nations, 4) is responsible for the worldwide problems and last but not least for 5) the horrible bloodbaths in Iraq. It was the same criminal "jesus" of the West who initiated the genocide of the Arameans, Greeks and Armenians. In this way, the "jesus" of the West has knocked off the Jesus Christ of the Bible of His Pedestal resulting in the decline of the true Christianity in the Western world. The true Christians are now a very small minority, while the fake Christians form the overwhelming majority, is has been taken over by the international satanic intrigue. To understand the difference between Jesus Christ of the Bible and "jesus" of the West, it is revealing to watch a video by Kevin Annet. Annet is a courageous Christian preacher in Canada who tries to unmask the horrible face of Jesus of the West. The coverage deals with killings, sterilisation and medical experiments on the Aboriginals of Canada. Please watch the video very careful and shudder about the atrocities committed in the name of “jesus” and how they are doing everything to cover up. Again, the satanists haven taken over the church. 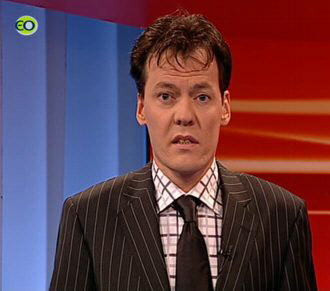 Broadcast of Current Affairs Programme ‘Het Netwerk’: 15-4-2008 by presenter Tijs van den Brink. On Tuesday 15-4-2008 at 20:30 h the current affairs programme ‘Het Netwerk’ was broadcasted by the Evangelical Broadcasting Channel. The presenter was Tijs van den Brink. Mr. Van den Brink became known to us as senseless and arrogant who is utterly misusing his position to terrorize the Aramean nation, something which he also has done in the past. Background information: What is all about? Before continuing with our analyse, it is useful to provide the reader with some background information. It is important to know that madam Tunc (Alias: Attiya Gamri, Attiya Xamri, Attiya Gamri Beth Arsan) has made some unholy individuals within the Evangelical Broadcasting Channel her doormat to advertise the criminal colonial Western spiritual genocidal product “Assyrians”. Madam Tunc is doing her best to accomplish the covenant between the PKK and GHB (http://www.aramnahrin.org/English/Monstrous_Alliance_PKK_ADO_24_4_1993.htm). In fact she is following the script laid down by the terrorist organisations ADO and PKK. It is known since long time that some wicked and nefarious individuals within EBC have made a covenant with madam and her family to distort the history of the Aramean indigenous nation, following the agreement made between ADO and PKK. Madam Tunc is an apostate Aramean who seizes every opportunity with both hands to distort the history of our nation by representing them by the colonial genocidal name “Assyrians”. She is a colonial product/victim of the immoral Western colonial perversity in the Middle-East and is being used by her Western masters to taunt our nation. Madam is being glorified, promoted and used by the descendants of the wrongdoers of yesteryear, in this case the hateful individuals within the EBC to torment and terrorize our nation. I agreement with covenant between the two terrorist organisations, the “Assyrians” ADO/GHB were granted 12 hour free of charge broadcast time with the PKK television MED-TV (predecessor of Roj-TV). Madam Tunc reveals this agreement in an article published in national newspaper Trouw on 21-12-2000. The hunger strikes for “justice” and other activities were nothing but a cover to involve youngsters within the PKK/ADO. The “Assyrian” GHB/ADO terrorist organisation was in 2006 added to the terror list of the Turkish Supreme Court. Madam Tunc with the PKK-channel Roj. 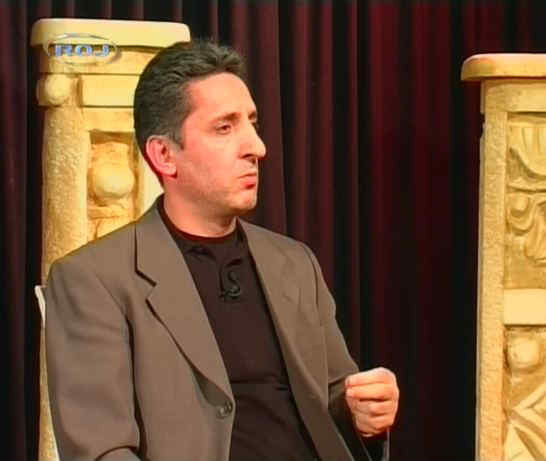 On 11-3-2008 madam Tunc was a guest with the programme “Qolo Hiro” of the PKK channel ROJ. “Qolo Hiro” is being presented by the two “Christian” presenters who wage a huge war against the Aramean nation in service of Roj channel, as agreed between PKK and ADO. The two gentlemen are Mr. Ozcan Kaldoyo (real name?) and Yahkub Rohyo (real name??). During the broadcast madam Tunc explained in detail about her activities and she told that at the beginning of April 2008 she would visit northern Iraq together with a political delegation from Holland and Dutch television. At the end only Mr. Joel Voordewind (Christian Union) joined the visit to northern Iraq. Together with madam Tunc and Mr. Voordewind also a team of the current affairs programme “Het Netwerk” of the Evangelical Broadcasting channel went to the north f Iraq to commit crimes against the Aramean nation. We don’t know whether these are the literal words of Geert Wilders or that this is fabrication of madam Tunc herself. Let we not hope that the Islamic world shall consider Geert Wilders as the defender of our people. Our people would then have real problems in the Middle-East, thanks to Madam Tunc. And madam Tunc? Oh, she is safe and relaxed in the West, far away from war area. If our nation would be slaughtered, madam and others would utterly misuse that to advertise the criminal genocidal ideology “Assyrianism” which in our days has led to terrorism. The transcript of the broadcast of 15-4-2008. Van den Brink: At the moment a car stops at the door, the breath is catched. Because before, their parents and sisters were killed by masked men. It could just happen that the brothers and sisters Zaya face the same fate. Because they are Christians and they live in Iraq. In the past 15 years hundreds of thousands of Christians have been expelled out of Iraq from their residences. Many went to the relatively safe north. But also there, they are not sure about their life. 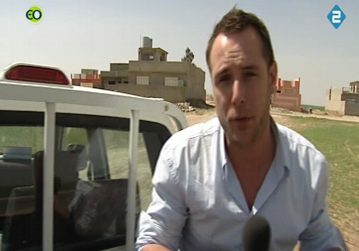 Johan Eikelboom went to the area where relief organisations do not dare to go because of the danger. Joel voordewind: Nuns, priests being abducted. The archbishop of Mosul has been killed, few weeks ago. Johan Eikelboom: Do you think that there is religious cleansing taking place? Johan Eikelboom: Upon our journey, we left the relatively more safe Kurdistan in north of Iraq and drive for Nineve plain. The Assyrian (Aramean) refugees, who do not leave for other countries, escape to this area. We hear shocking stories. We are right now in the north of Iraq and are going from Erbil to Dohuk. Erbil is situated around 600 km north of Baghdad. Dohuk is in the nineve plain. The plain where thousands of Assyrian (Aramean) Christians took refuge because of violence of extremist Muslims. Assyrian (Aramean) are being killed, raped and abducted. We are going to investigate their situation and what their stories are. And yes… it happens every day… still bomb attacks, abductions and killings thus… we have to be extremely careful. We travel under armed protection to the small village of Batnaya in the plain of nineve. We pass through several checkpoints. Because the Kurds who control the area don’t want to take any risk. We arrive here at the small village of Batnaya. We are going to visit a family, over there you see them, with four children… they lost their parents and a sister and they too escaped Baghdad. Zahed, Lina, Zay and Rita. They escaped in 2004 from Baghdad to Mosul. Their parents and sister have been killed. Their older brother is disappeared. And during run away also their younger sister dies. Lina Zeya: It happened like this: I came from school and went home. All neighbours were standing near the door. I asked myself what was going on. Translator (madam Tunc): Who killed your parents? Lina Zeya: We don’t know. There came masked men inside the house. They told my parents: ‘you work for the Americans’. My parents denied. They told: you Christians, all of you work for Americans. My mother answered: we do not. At that moment one of them pushed my father…. And shot him in his head and heart. After this my parents and sister were shot dead. Johan Eikelboom: The children escaped, with the help of the neighbour, after the killing of their family to Mosul. In this dangerous area they stayed for a year. After this the Kurdish government offered them this house in the nineve plain. However while waiting on the house, next tragedy takes place. Their youngest sister, having asthma, suffocated from dust on the place where they were sleeping. Lina Zeya: For three months we had to stay on the graveyard. For three months long we had to sleep there. And then also my sister died there. When we got this house, we did not feel happy. And a house cannot give us happiness. We came from one disaster into other. We did not enjoy any happiness. Johan Eikelboom: Only the oldest son is working as a car mechanic. Others have no work and they cannot go to school because their papers are still in Baghdad. Translator (Madam Tunc): Why are not you going to school? Rita Zeya: De required official papers are in Baghdad. Translator (Madam Tunc): Do not you have the right to go to school? Rita Zeya: Not here. To get a place in school, you need official papers. We cannot go to school. It is too dangerous. Our papers are in Baghdad and we do not know here how to get it. When we told that we could not go to Baghdad… they told us that it was not their problem. That is the reason we stay here. Translator (Madam Tunc): Are you angry? Rita Zeya: I don’t know. This is our fate. Johan Eikelboom: There is here hardly any help for refugees. This family was lucky to get this big house. However most of them got nothing. The Kurdish government does not have much money and the international organisations do not come in the nineve plain because it is dangerous. All villages have protected themselves because of fear of attacks. Via our translator (= madam Tunc) we are told that also here attacks have been committed. Translator (madam Tunc): He says that two attacks have been committed here. Since then we decided to put checkpoints, to have enough men with weapons to protect the Christians in this village. A person in an army unform: Mosul is near Telescoop. We only give access to Muslims without identification if somebody acts as guarantor. We have been facing a thing or two. After two explosions we became afraid. That is the reason that we are ready for 24 hours. Johan Eikelboom: Then there is discussion…. about our film team at the checkpoint. Johan Eikelboom: We now drive into the small village of Teleskopa… Only 5 thousands people are living here. And 60 families escaped to this village. And they all are being taken care of by the people in their homes or they build very fast new houses. Preferably…. they would start with the building their own small state. One of the escaped families is Jacob. Leyla lost her brother and a brother-in-law. Her brother was tortured. Leyla Jacob: We were scared to look at my brother. I did not recognize him. He suffered a lot of pain. He has been tortured with cigarettes. He had shot wounds. His head… it was terrible. Translator (Madam Tunc): Did they mutilate his body? Leyla Jacob: Yes, all over his body. We did not dare to look at him. Translator (Madam Tunc): Did you found his body on the street? Leyla Jacob: Yes, he was killed. His body has been for ten days in the street. Johan Eikelboom: Before the collapse of Saddam Hussein, there were approximately 1,4 million Christians in Iraq. They relatively led a quite life between the Muslims. Saddam trusted them and they formed in majority his household. Now they are considered as confederates of Americans and as unbelievers. Christians and Churches are now targeted by Sunni as well Shiites. Leyla Jacob: When I consider how my children are being threatened here, than I worry about their future. Johan Eikelboom: On our journey, we came across Joel Voordewind, member of Parliament for Christian Union. He has worked and lived here in the area as relief worker. Now he wanted to know how the situation of the Christians in Iraq is. We are on the way to the plain of Nineve, some 20 km above Mosul. The UN relief workers do not dare to come here. Is this not a huge risk? Joel Voordewind: It is a risk, but I have decided myself to personally come and check the situation of this people who are in a perilous situation… who are living in small apartments with too much people, if they already have accommodation… deprived of aid. I want personally speak with them what they are going through. Johan Eikelboom: Is it the risk worth? Joel Voordewind: Certainly, it is worth. Johan Eikelboom: At this moment there are only 300.000 Assyrians (Arameans) left in Iraq. Hundred thousands of them have escaped to abroad, among whom many of them to the north of Iraq. Under threat, they left everything behind. Joel Voordewind visits them in the north of Iraq. Translator (Madam Tunc): Her son is kidnapped. Her son is two years ago kidnapped. He worked with American… Christians are being slaughtered. Johan Eikelboom: The Assyrians (Arameans) are being expelled. Abductions, ransom, killing and bomb attacks. It is the rule rather than the exception. Also still now… while they have escaped, they receive threats by letter or SMS. The only way to escape the violence is to act as if you are no Christian. Joel Voordewind: Really, a complete male generation is being exterminated.. eh? Johan Eikelboom: Suddenly, we here a shoot. The guard responds immediately. It seems a false alarm. I feel you have some kind of anger. Joel Voordewind: Yes, because the stories repeat themselves. Because there is absolutely no protection for this people. Because it is specifically aimed at the Assyrians (Arameans) and Christians. Johan Eikelboom: Is there also a kind of anger towards Americans? Joel Voordewind: Yes, because we understand that the people who first have worked for the Americans have risked their life and at the end they have been killed and they absolutely get no compensation…. even their funeral is not being paid. This is something I do not understand. This, I will check. Johan Eikelboom: Back to family Zeya in Batnaya. The youth is constantly scared… that something will happen to them anyway. Translator (Madam Tunc): Are you scared when a car stops in front of the door? Lina Zeya: Sure. If in the night being knocked on the door, we do not go out. Never. I will tell you the truth: What we have experienced in Baghdad … is something which we never will forget. Johan Eikelboom: Lina and her brothers and sister do not see a way out and have no hope for a better future. The sorrow is overwhelming. Translator (Madam Tunc): But the youngsters want to laugh and dance… a nice life? Lina Zeya: No, that does not apply to us. We have a lot of sorrow. It is difficult because of my father, mother, brother and sister. We cannot. Even if we laugh, it does not come out of our heart. No. Johan Eikelboom: I there according to you a matter of religious cleansing? Joel Voordewind: Yes, you can say like that if you look at the numbers, if you hear the stories, really aimed, also the threat letters signed by the Mujahadin, death to Christians. Johan Eikelboom: That is very fierce. Because than you will get a Middle-East without Christians. Joel Voordewind: Yes, that is why we have to do everything to help the Christians to protect them as much as possible in their own land where they have been presence for thousands of years. And we are doing this by protecting them. But also to taking care that the aid correctly reaches them. 1. During the broadcast they spoke 7 times the term “the plain of nineve”. This is the ideology of AINA: The international lie- and hate machine and the cause of killing, persecution and decline of the Arameans of Iraq. AINA almost succeeded to cause bloodbath among the Aramean Christian nation of Iraq thanks to these kinds of slogans. 2. Johan Eikelboom speaks 5 times of “Assyrians” in reference to the Aramean nation of Iraq and commits with that a terrible act of crime against the Aramean nation, it is a spiritual/cultural genocide. These misguided individuals have no respect or morality; they just continue the immorality of their forefathers to terrorize our nation by maintaining the perverse spiritual colonisation of our nation. 3. The only person who does not fit in this broadcast and therefore should not had to participate in this unholy broadcast, was Mr. Joel Voordewind. We believe that Voordewind has good intentions and he really wants to help the Aramean Christians in Iraq and elsewhere. The problem is however that the good intensions and purity of this kind of people easily can be manipulated and misused by those who keep a secret agenda to push for the criminal immoral spiritual product “Assyrians”. What “Assyrians” and Christians Mr. Voordewind? Are those who call themselves “Assyrians” not Christians? Why explicitly mentioning the word “Assyrians”? A while back, Mr. Voordewind got a copy of the Multi Media Project The Hidden Pearl regarding the history, faith and culture of the Aramean indigenous nation of the Middle-East. Why then mentioning the criminal colonial lie-and terrorist product “Assyrians” and neglecting the Aramean nation? Or perhaps is Mr. Voordewind not unaware of these hateful matters to exterminate the Aramean nation? Or perhaps was it to be the doormat of madam so extremely attractive that he could not stand aside and felt forced to glorify the lie in stead of the truth? Nevertheless, we are convinced that Mr. Voordewind is an honest and pure person who just want to help others from his purity. This definitely does not apply, to our view, to people like Tijs van den Brink and others within the Evangelical Broadcasting channel who we consider as malicious and hateful individuals with no morality who misuse their media power to spit at the face of the Aramean nation by maintaining the criminal product of the Western colonialism. …………….. Upon our journey, we left the relatively more safe Koerdistan in north of Iraq drive for Nineve plain. The Assyrian (Aramean) refugees, who do not leave for other ountries, escape to this area. We hear shocking stories. We are right now in north of Iraq and and going from Erbil to Dohuk. Erbil is situated around 600 km north of Baghdad. Dohuk is in the nineve plain. The plain where thousands of Assyrian (Aramean) Christians took refuge because of violence from extremist Muslism. Assyrians (Arameans) are being killed, raped and abducted. We are going to investigate their situation and what their stories are. This is typical malicious tactic of some fake and hateful so-called "Christians" and in particular some evil evangelical “Christians”. What a horrible apostates within Christianity! They have caused so much hatred in the 16th and 19th century with abominable consequences for the Aramean people. They have divided, created unprecedented hostility within our nation through which they were made vulnerable to the hostile environment of the Middle-East. And that is exactly what is happening in Iraq. Why do not they talk about the horrific crimes committed by the Western colonial activities withing our people that utterly destroyed them? What they do however is to very carefully camouflage and approve their criminal acts committed against our nation by mocking and spitting at the face of Islam. The Islam is nothing but a powerful instrument in the hands of the Western colonial powers. The impression is that they rather misuse the Christian faith, to cover their own evil acts; that is all. Yes, the Arameans are suffering in Iraq. However the suffering of our people in Iraq is exclusively due to the satanic acts of dividing and ruling in the name of “jesus of the West” committed by the Western colonial powers. Indeed they have created, in the name of the horrible "jesus" of the West, hatred and incited our nation against one another by planting fake names in their minds, namely “Chaldeans” (16th century, Catholics + France) and “Assyrians” (19th century England + Anglicans). This spiritual colonial genocide and intervention was carried out by inciting son against the father, daughter against the mother, family against family, village against village, has caused unprecedented hatred and sorrow within our nation resulting in their decline in the Middle-East, their Diaspora and their hopeless situation now. In addition, through this division they were made vulnerable to the hostile environment of the Middle-East where they are threatened with extermination and ethnic cleansing. And what are you now doing? You just happily and relentless continue with the criminal political/spiritual acts of the past by identifying our nation with the terrorist name “Assyrians” as if nothing had happened and your forefathers have committed a holy act. This is to our observation immoral and objectionable. Please do not involve Islam in these matters, Islam has nothing to do with this, do not misuse Islam to cover your own criminal acts of the past. Islam is simply instrument effectively used by the colonial Western powers. You are the big evildoer and creator of hatred and definitely not the Islam. Islam did not incite our people against one another, it was you, western colonial powers. Islam did not invent fake names “Assyrians” and “Chaldeans”, no it was you. Islam did not torn up our nation in pieces, no, it was you and your criminal "jesus" of the West who of course has nothing with Christ Jesus of the Bible. What the fanatic Islamists in Iraq are doing is simply finishing the work of your forefathers, that is all. You ridicule Islam only as a smoke curtain to carefully cover your own atrocities against our nation. And this sounds like ridiculing others to present yourself as “the good” and “civilised” ones. …………….. We now drive into the small village of Teleskopa… Only 5 thousands are living here. And 60 families escaped to this village. And they all being taken care of by the people in their homes or they very fast build new houses. Preferably…. they would start with the building their own small state. One of the escaped families Jacob. Leyla lost her brother and a brother-in-law. Her brother was tortured…….. This is really playing with fire! You dangerous bandits, you want a complete extermination of our nation in Iraq so that you would have enough stories to spit at the face of Muslims? Nobody want there to build their own small state, except your “friend” madam Tunc (who was your translator) and the bandits of AINA. By vomiting such dangerous and irresponsible statements regarding "own small state" you provide some groups in Iraq with perfect excuses to slaughter the Aramean nation, who you call them “Assyrians”. In our analyse “AINA: The international lie- and hate machine and the cause of killing, persecution and decline of the Arameans of Iraq” we explained in detail that the criminal “Assyrians” almost succeeded to cause a massacre among our nation in Iraq. Fortunately, this could timely be prevented by the intervention of a respectful Aramean bishop. And this Eikelboom, you of course will never tell on television, because some of you hate the truth so much. You have been completely bewitched by madam Tunc who is also eager to talk about “safe haven” with terrible consequences for our people in Iraq. In addition to this Eikelboom, you and other of madam Tunc who seem to love the lie so much, completely neglect the letter which has been sent to the government of Iraq by our organisation, the Aramean Democratic Organisation and the Aramean bishops in Iraq. Of course these matters mean nothing to you and other others who are doing everything to terrorize our nation. It was you who cheered Bush and his club when they invaded Iraq where thousands children, men and women have been slaughtered. And now, to cover all these abominable atrocities you bring the hateful colonial satanic product “Assyrians” of your forefathers under the attention to ridicule and spit at the face Islam. But you guys, you are the evildoer, not the Islam, you have created hatred, not Islam, all evilness was created by your forefathers, Islam has nothing to with this divided and rule politics. This is your immorality and not Islam’s ! ………… Before the collapse of Saddam Hussein, there were approximately 1,4 million Christians in Iraq. They relatively led a quite life between the Muslims. Saddam trusted them and they formed in majority his household. Now they are considered as confederates of Americans and as unbelievers. Christians and Churches are now targeted by Sunni as well Shiites. What nonsense is this? Everybody is suffering in Iraq. The extra suffering of the Aramean Christian nation in Iraq, has nothing to do with the Islamists, but it is mainly caused by the deadly, hateful and criminal division implemented by the colonial powers within our nation (here, here). Just simple as that. Therefore please do not ridicule the Islam; you are the guilty one and not the fanatical Islamists, who just finish the work of your forefathers. At same time you completely ignore your own crimes against our nation. Please do not tell lies to the viewers! Everything was in detail arranged in Holland between you, madam Tunc and Mr. Voordewind, wasn’t it? And now you act as if you were not aware of the visit of Mr. Voordewind? Systematic lies and fallacies, including lies about the Aramean nation whom you call “Assyrians”. …….At this moment there are only 300.000 Assyrians(Arameans) left in Iraq. Hundred thousands of them have escaped to abroad, among who many of them to the north of Iraq. Under threat, they left everything behind. Joel Voordewind visits them in the north of Iraq. 300.000 “Assyrians” in Iraq? That is a joke! You mean the total number of the Aramean denominations in Iraq? Among the Aramean denominations in Iraq, there are certainly no more than 5.000- 10.000 people in Iraq, who eventually may call themselves “Assyrians”. These are the members of the East- Aramean Nestorian Church, also known as “The Assyrian Apostolic Catholic Church of the East” and “The Ancient Church of the East”. In addition to this, the majority of the members of the aforementioned churches identify themselves as “Suryaye”, that is to say “Syrians”. So, "Assyrians" are tiny minority and definitely not 300.000! ………The Assyrians(Arameans) are being expelled. Abductions, ransom, killing and bomb attacks. It is the rule rather than the exception. Also still now… while they have escaped, they receive threats by letter or SMS. The only way to escape the violence is to act as if you are no Christian. There you go again. Why special the word “Assyrians”? Arameans suffer also, don’t they? Chaldean suffer also, don’t they? All of them not important, only the immoral colonial product "Assyrians"? Or is this a method to “Assyrianize” all of them, like planted in your minds by your “friend” and “adviser” madam Tunc? The Yazides also are being expelled, kidnapped, killed, don’t they? This is also true for the Sunnis who are killed by the Shiites and visa versa. Why trying to misguide the viewer by camouflaging your own crimes of the past? Why attacking and accusing others and exculpating yourself? The Western colonial intervention have destroyed the Aramean nation and nothing else. Islam is finishing the colonial work. …. That is very fierce. Because than you will get a Middle-East without Christians…. Exactly Mr. Eikelboom. And the criminal Western colonial powers have been working on this by planting of hatred and divisions within our nation, which you continue to glorify until today. You are the evildoer and not the Islam, you marched into the Middle-East and have wreaked havoc. It was not the Islam, no it was and only you under the supervision of the criminal "jesus" of the West who besmirched the name of Jesus Christ of the Bible. Islam is only finishing the work of the colonial powers. ….. Yes, that is why we have to do everything to help the Christians to protect them as much as possible in their own land where they have presence for thousands of years. And we are doing this by protecting them. But also to take care that the aid correctly reaches them. Well Mr. Voordewind, as long as you continue to glorify the immoral colonial product of the colonial powers, you will not help the Aramean Christians in Iraq. As long as you follow the “advise” of madam Tunc, the situation will only deteriorate. Therefore to protect the Aramean Christians in Iraq is first of all not to let yourself to became the doormat of madam Tunc. You help the Aramean Christianity in Iraq by going to the source of the problem, namely the hateful division caused by the Western Christianity (als here, here). That is the main problem. The Kurds are aware of this, the Turks are aware of this and the Arabs are aware of this! As long as the Aramean nation is not respected, as long as the Western intervention is not condemned and the spiritual colonial fake names “Chaldeans “ (invention Catholic Church + France) and “Assyrians” (invention Anglicans + England) are not renounced, all the attempts to help the Aramean nation on long term will mean nothing! That is all about and nothing else!